One of our newest additions is our 10 foot LED lighted artificial palm trees. If you’re looking to make a statement and wow your guests then you’ve just found the right tool for the job. They come in two color patterns, white or brown and green. White is perfect for wedding receptions, winter events, night clubs or even for your home if you have the room. The brown and green tradition palm tree colors are great for summer events or if you just want to add a special pop to an entrance. If you’re an event company these are great to use as a rental or add to your party décor. Since these are not the least expensive thing we carry, they are the most unique. 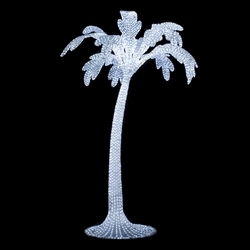 Traditional lighted artificial palm trees are typically a normal silk palm tree with some lights strung up and down the trunk and palm fronds. They look nice and give off a nice ambiance but they rarely make a statement. If you want to find out how to make a statement at your next event, click on the links below to view the trees. Thank you for reading our blog, however these trees have been discontinued.